ONE SAILING EXPERIENCE A LIFETIME OF MEMORIES. The Mirage offers unrivaled spaciousness and elegance and a spacious platform for Weddings, private events and pares. Step on board the Mirage and you will see the true meaning of excellence from the moment you set Sail. Savour gourmet delicacies prepared to perfection in the spacious galley, or the two large stainless outdoor grills by a private chef. Reabow the majestic beauty of the Cape and its surrounding mountains is at its best when viewed from the sheltered waters of the Table Bay. This majestic backdrop is highlighted by abundant integration of sea life of which the Cape has been so richly bestowed. Sailing within such beauty is an experience that will forever be treasured. Maximum capacity of 130 pax (including crew, caterers, DJ etc.) 118 pax is recommended. Table Bay and surrounding areas and routing is weather dependent. Cruise time and cruise course are dependent on weather conditions and at the discretion of the skipper. You and your guests’ safety will always be our primary priority. We recommend a windbreaker jacket, non-deck marking shoes (eg trainers/deck shoes, no black soles), sunglasses and sun lotion. Attire based on the event from casual to formal. On arrival you will be met by our fully trained crew and stewardesses and will be presented with a welcoming MCC/Prosecco or sparkling juice. Crew and stewardesses. Fuel. 3x large toilet facilities. Exclusive use of the yacht. 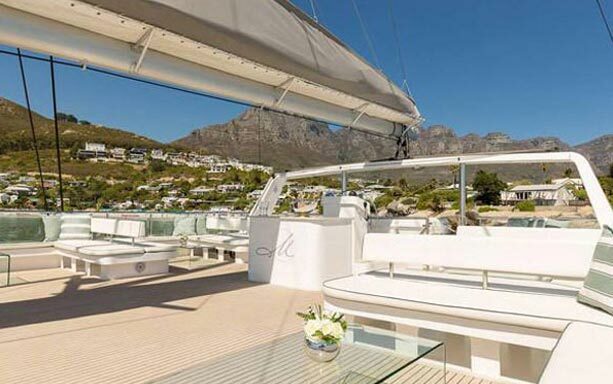 Bar Service – available on board where guests can either pay cash or pay a deposit prior to the charter. We can hire a slushy machine for those summer cocktails. (Beverage list available). Mirage can supply: Ice buckets and glasses (champagne, whisky, wine and beer). We do not have cocktail glasses, Large bar fridge and ice. Water toys - For charters 4 hours and longer we offer the use of our floating pool, water slide and SUPS. Lifesavers - For larger groups involved in the water sports we can arrange for lifesavers to be on board. Catering - We recommend canapé style catering and can assist with finding the perfect chef or catering company that can best suit your requirements. (Sample menu available). Otherwise you can arrange your own catering at no extra fee. DJ / Entertainer - we have numerous DJs on our supplier list and are happy to facilitate that for you. Cape Town based Singer/Entertainer details available on request. Should you wish to supply your own there is a table on the flybridge for the DJ to put his/her equipment on. They will need to bring their own equipment and speakers.